He was dismissed for unleashing a tirade on the officials after they made a flagrant foul call on Draymond Green. But the loss was nothing compared to the vitriol with which Kerr lost his temper, destroying his clipboard and stepping onto the court in his lambasting of referee Ken Mauer. Kevin Durant had to help his coach off the court as his vein-bulging tirade ensued, before the 53-year-old eventually took his marching orders. Asked whether his outburst was beneficial ahead of the break, Kerr was initially suspicious in his reception of the question. 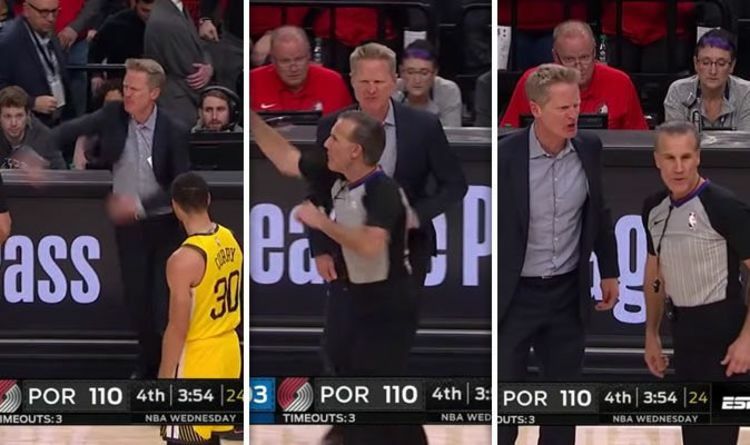 Steve Kerr was ejected for his outburst (Image: YouTube/ESPN)“But I’ll talk to my psychologist tomorrow and see if that’s accurate." Kerr explained the rationale behind his rant further, saying: “I was shocked they were even looking at the replay, so we’ll get an explanation from the league.